Rick Shaefer's solo exhibition, Three Trees: Life-Size Drawings, will open Feb. 16 at Silvermine Arts Center in the Vassos Gallery. The artist leans over his painting New Oak, part of the exhibiit. Uprooted Sycamore is among the paintings. 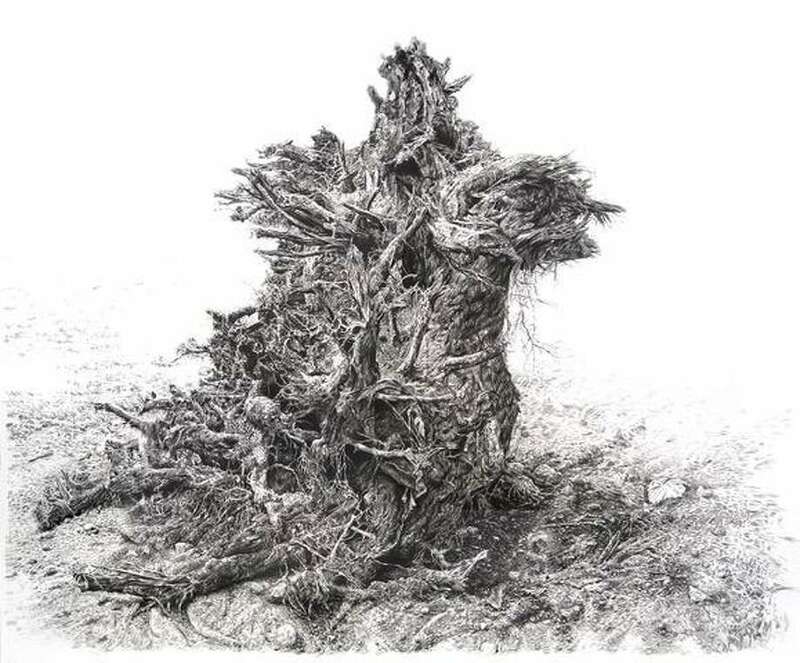 Rick Shaefer’s solo exhibition, Three Trees: Life-Size Drawings, will open Saturday, Feb. 16, in the Vassos Gallery at Silvermine Arts Center, 1037 Silvermine Road, New Canaan. Shaefer, of Fairfield, won Best in Show in Silvermine’s 67th Art of the Northeast, and this solo exhibition is a result of that honor. An opening reception is set for Sunday, Feb. 17, from 2 to 4 p.m.
Shaefer draws with charcoal — using a language of mark-making that is defined, gestural, and rhythmic — to create life-sized images on vellum paper. “The richness of detail, reminiscent of Rembrandt’s etchings or Durer’s woodcuts, imbues the work with a resonant stillness and dignity,” according to an announcement from Silvermine. “I do not use the charcoal in the classic manner with rubbing and smudging the tones and erasing to bring back highlights. My technique resembles the look of etching, engraving, lino or woodcut in that each line is distinct, and tone is gained by crosshatching or scribbling. The intent is to highlight the act of drawing, the myriad decisions made of putting down each mark in succession,” said Schaefer. “The three trees in this exhibition give full rein to Shaefer’s fascination with the majesty and the ponderous bulk of these fallen oaks and the exquisite complexity of the underside of the pulled-up Sycamore stump: views that we might pass by without notice if they were not pulled from their surroundings and placed directly before us. In isolated stillness these drawings communicate with us in a palpable way,” according to exhibit organizers. There is a strong 16th and 17th century Dutch, Flemish and German influence running through his landscape and botanical drawings, according to Silvermine. “I spent a good portion of my formative years living in northern Europe and I think the mood of this artistic genre, with its operatic skies and windy vistas, resonates with me still. Much of the Dutch still-life and landscape art tradition is permeated with symbolism and imbued with narratives that transcend the actual scene depicted. Many are memento mori pieces, meant as reflections on mortality and the transient nature of existence,” the artist said. Shaefer’s work has been exhibited throughout the United States. He was awarded Best Show in Art of the Northeast at Silvermine in 2017. His solo exhibition runs concurrently with ReFRAMING Aging: Health, Happiness and the Arts and will be on view through March 23. Silvermine Arts Center is one of the oldest artist communities in the United States. Its five-acre campus in New Canaan consists of an artist guild, school of art, arts and fine crafts shop, and gallery. Silvermine is a nonprofit organization that also offers an Outreach Education Program, Art Partners, and hosts lectures, film screenings and special events. For information, call 203-966-9700, ext. 20 or visit silvermineart.org.